Yahoo was able to modify Red Hat's open source Celph storage software to lower latency times. Red Hat continues to make inroads into the enterprise storage software market, improving two of its core storage technologies and striking partnerships with key IT system resellers. The company has updated both its Ceph and Gluster storage system software, in time for the Red Hat Summit, the company's annual user conference, held this week in Boston. Although Red Hat was initially known for its corporate-ready version of Linux, Red Hat Enterprise Linux, it has been expanding its open source-based stack to accommodate additional needs of large organizations, including software to manage large amounts of storage. Red Hat took over the stewardship of the open source Ceph file system last year when it purchased Inktank Storage. It brought the Gluster file system, also open source, into the fold in a 2011 acquisition. Gluster can be used for setting up storage clusters to hold large amounts of data, such as log files for big data analysis. Casio and Intuit both use Gluster. Ceph, on the other hand, is ideal for cloud workloads, particularly those that need object-based storage. It is frequently paired with OpenStack cloud deployments. Yahoo uses Ceph to store for its Flickr photo sharing system. 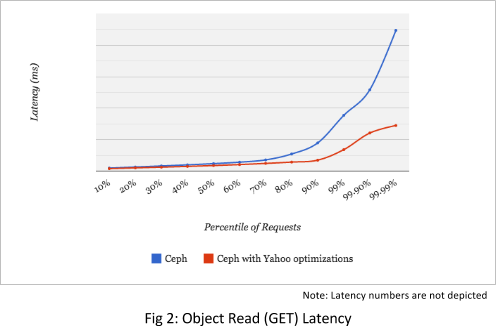 Because Ceph is open source, Yahoo was able to tweak the software to work more efficiently for its own case load. With Ceph Storage 1.3, Red Hat used contributions from Intel and SanDisk to equip the software to work with solid state flash devices. Flash is quickly becoming the predominant medium in today's servers, said Ranga Rangachari, Red Hat vice president and general manager for storage and big data. Ceph has also been improved for virtual environments. The software can boot up more quickly in virtual machines, thanks to the use of read-ahead caching. Work has also been done to limit disk fragmentation, when blocks of data are distributed about a disk in such a way that it is difficult to quickly read them all. Ceph 1.3 is also smart enough to not let bureaucratic meddling slow performance at crucial times. It can block routine automatic administrative checks from taking place during periods of peak usage, when they could slow responsiveness. Developers also refined the software so that routine functions will run faster, such as resizing, deleting or exporting blocks of data. Gluster got some new capabilities with its update as well. This is the first version of the software that does not require RAID (redundant array of inexpensive disks) technologies to ensure data integrity, meaning organizations could save on storage hardware by as much as 75 percent, given they would not have to buy the additional storage to make duplicate copies of the data. Gluster can now also guard against bit rot, or the gradual decay of files on disk that can, over time, render them impossible to read. Gluster can now also take the place of hierarchical management systems (HSM), which offload old or less consulted data to less costly, slower storage systems. Gluster now offers operators fine-grain control of where to store data. Red Hat struck a few deals with other IT service providers to expand the potential customer base for its storage software. About 60 percent of commercial Ceph or Gluster sales are done by Red Hat itself, but the rest are executed by partners, Rangachari said. Systems provider Supermicro, which has offered Gluster systems, is now offering Ceph-based storage systems to its customers as well. Multimedia optimization software provider Vantrix has packaged Red Hat Gluster Storage into its Vantrix Media Platform to provide organizations with a way to store, archive and serve large amounts of content. At the Summit, Red Hat also demonstrated some storage technologies it is currently developing. It showed off software that allows administrators to manage a diverse array of different types of storage systems from a single console. This software should be released later in the year, Rangachari said.